The conditions were pretty rough. It began raining as the captain's meeting ended, and the rain did not stop all day. Brad Meagan came out on top with a 5-fish limit that totaled 74.25'. He also took big fish honors with a 19.75' largemouth. The next stop on the SCKF Bass Tournament Trail will be April 9th out of Lighthouse Landing on Lake Greenwood. 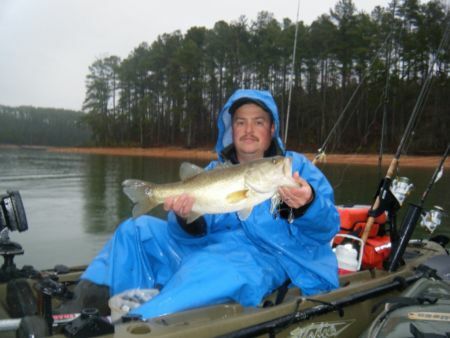 To learn more about the trail, and about other kayak news in South Carolina, visit www.southcarolinakayakfishing.com.